Propshaft Engineering is a family owned business operating in the heart of the Cape. We have been trading since 1988 and specializing in the repair, manufacturing and supply of only propshafts and components for the use in the drivetrain industry. 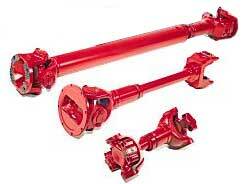 Due to this un-interfered product line, we carry an extensive range of components to suit the needs of virtually all propshafts in the South African market including all standard rear wheel drive pickups, taxis, trucks and four wheel drive vehicles, machines, power take off’s (PTO) industrial, construction and agriculture driveshafts. And manufacture shafts to your design. We offer a collection and delivery service within a 50 KM radius and pride ourselves on same-day service. Please check out our part descriptions and the map provided for our location.